The company's first widely available custom Xbox One S — the console redesign announced at E3 — draws on Gears 4 for inspiration. Its blood-red exterior is scored by faux claw marks, a nod to the upcoming game's new Swarm menace. 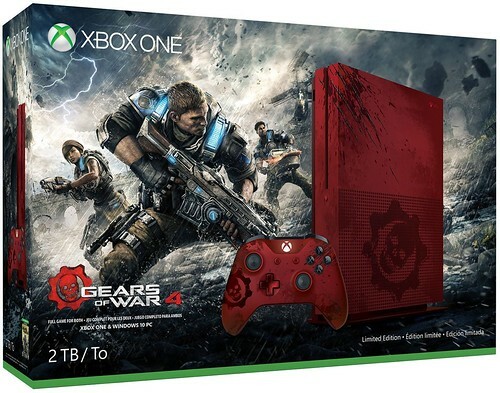 The limited edition Gears of War 4 Xbox One S sports a 2TB hard drive and a custom "Crimson Omen" controller that borrows the console's color scheme. The controller features the same distinctive claw marks as the console along with other nifty flourishes, such as a bloody thumbprint splashed across the D-pad. It will also be sold separately. The claw marks were added using a laser-etching process that cut into the plastic casing deep enough to ignite a fire. On the digital goods side, the console bundle includes a download code for Gears of War 4: Ultimate Edition (for XB1 and Windows 10), early access to the game on Oct. 7, Gears 4 weapon and character skins, a multiplayer lobby emblem and six "Gear" packs containing in-game items. Microsoft will also be releasing a second Gears 4-themed controller, also priced at $74.99, as a GameStop and Microsoft Store exclusive. This one features a grey-and-blue color scheme based on the armor worn by protagonist J.D. Fenix, the son longtime Gears hero Marcus Fenix. Both controllers sport the same enhancements that Microsoft revealed at E3 2016 in June, including a newly textured grip, Bluetooth support and increased wireless range. The two sold-separately controller packages also include some Gears-specific digital goods to justify the premium $74.99 pricing. You'll get a multiplayer lobby emblem and three "Gear" packs. It's not yet clear what these packs will contain, but it'll likely be cosmetic enhancements for the game's online modes. Pre-orders for the console bundle are up now and pre-orders for the controllers open on Aug. 1, with the bundle priced at $449.99 and controllers selling individually for $74.99. Orders will start shipping in mid-September. With Microsoft releasing a new system that is like 6 times more powerful than the Xbone next fall, I feel really bad for anyone who spends $449 on this system now. I don't feel bad for anyone buying this system as opposed to the next, more powerful, system. They either couldn't be bothered to do the research to know what was up next in hardware, or they have the disposable money to waste. Either way, I find the entire Xbox platform akin to the walking dead right now. It's like a guy sitting in his car after the crash, internally decapitated and bleeding to death internally, but feeling reasonably fine; a goner and doesn't even know it. I feel really bad for anyone who can't afford to indulge their hobby. BTW, I'm almost 53 years old and a year seems like an unacceptable time to wait to avoid purchasing something I can easily afford that will be an upgrade of something I use every single day, and not just for playing games. That's what disposable income is for. Insta-skip. Still only runs 2-3 exclusives worth playing. The artist did a pretty good job on this. I was once internally decapitated and it wasn't actually that bad. I will buy this day one and sell my xbox one to somebody less fortunate (money) than me for an excellent price. Karma. Already have it pre-ordered. So happy they are doing this! And Scorpio is day one also. Stop living check to check people. It isn't hard to do. Perhaps not for you or for me, but that's not the case for tens of millions of people whose jobs have evaporated, been taken by foreigners (legal or illegal) or whose pay is down due to global competition (outsourcing). Paycheck to paycheck is the way it is for the majority of Americans. I'm buying the S, but I'll stick with the white one. I'm also buying a Scorpio day one. We come to sites like these because we like gaming. Or at least I do. I love owning consoles. I'm def buying that mini NES coming out in November as well. Luckily I don't need to upgrade my PC for probably another year or so. GTX 970 and 16GB of DDR4 will last awhile. My bet is, there won't be software that really takes advantage of the Scorpio for a while. I'm sure it'll run Gears 4 at 60 in 4K, but it's already running 60 on the X1, (multi anyway), so unless you have a 4K set, you're gonna be waiting for Halo 6 in 2018 to really see the Scorpio shine... well, maybe Forza 2017 might show it off too, if you're into that. I have to admit I'm torn - I like the look of the S, but it's not going to do anything for the games, I already use a 3TB external drive and that's a few games worth of cash I could play while waiting on Scorpio to appear... but if I didn't already have an X1? This would be a sweet deal. At this point they should have sold this for $199. Then I'd bite. Otherwise waiting for Pokemon.... I mean Scorpio. I'd just worry that this new version will bring back the RROD. I would wait and see if they don't all start melting before putting any money on it.